At the protest in Algiers, one member of the crowd, named as Ali, told Reuters news agency: "We only have one word to say today, all the gang must go immediately, game over." Who could succeed Algeria's president? 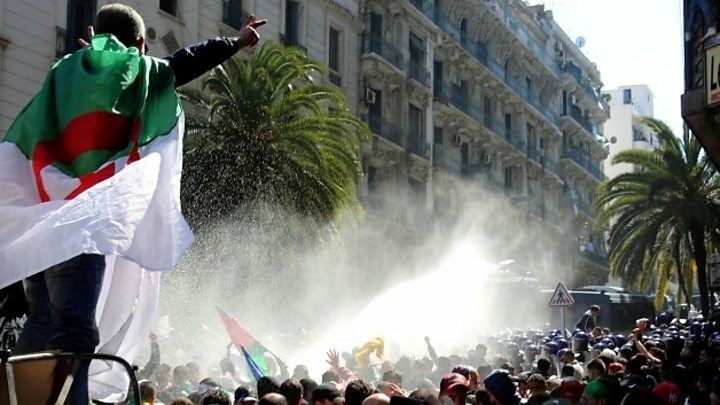 Said Bouteflika: Many in Algeria believe the president's younger brother is the de facto ruler of the country. He is described as being the president's gatekeeper, leading the presidential clan and protecting its interests from behind the scenes. Lakhdar Brahimi: One of the country's most respected veteran diplomats, Mr Brahimi had a successful career at the highest level in the UN General Secretariat. When protests in Algeria first began, Mr Brahimi was chosen to head a transitional conference on the country's political future. Ali Benflis: The founder of the state-run Algerian League for Human Rights was appointed minister for justice in 1988. He was named prime minister in 2000 but dismissed in 2003. He is considered a possible successor despite losing presidential bids in 2004 and 2014. Ali Haddad: The former head of Algeria's Business Forum was identified by Algerian and French press as being one of the main financiers of Mr Bouteflika's 2014 re-election campaign. Ahmed Gaid Salah: The army chief of staff has created controversy by commenting on public matters, leading many to believe that he has presidential ambitions. The Lt Gen has also frequently helped Mr Bouteflika undermine the position of other generals.